This post is designed to give you the basic technique for making mayonnaise and aioli. Aioli is a flavored mayonnaise, and despite its associations with garlic and chilies, it doesn’t have to be spicy. 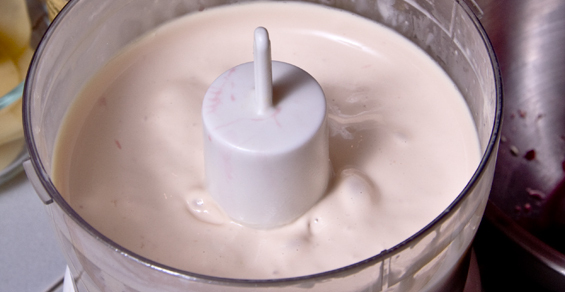 Includes Recipes for: Blood Orange Aioli, Chile Aioli below. We also have a White Truffle Aioli Recipe as a separate post. 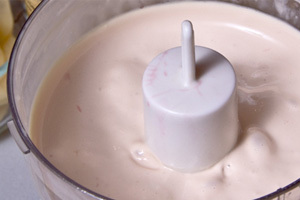 Homemade mayo has a light yellow tint (or pink in the case of the blood orange aioli pictured above) and a stronger flavor, unlike the white, preservative-laden, store bought versions. Neutral flavored oil as needed (grape seed oil, olive, or canola oil) although fine flavored olive oil may be used instead. In a food processor or blender combine the egg yolks, a little dry mustard, vinegar, salt and water as needed to give the mixer enough mass to work with. Blend on high speed until the ribbon stage has been reached (the eggs are a lighter color and flow back on themselves with momentarily visible shapes). Continue to blend, starting to drizzle in the oil (start slow) in order to form an emulsion. The more oil you add the thicker the aioli/mayonnaise will become (the lecithin in a single egg yolk can emulsify up to 8 oz of oil). Your mayonnaise/aioli will keep for up to two weeks in the fridge. Be sure to cover it very well so the fat doesn’t absorb flavors from the other items in your refrigerator. To make aioli, follow the recipe above, except where variations are noted. (Used in our Chili Marinated Bison Kabobs with Blood Orange Aioli). This aioli will be thinner than most and suitable for use as a dip. This recipe can be easily modified to use other citrus fruit. Replace the mustard in step 1 with half of a small garlic clove, add blood orange juice as needed after step 3. 1 blood orange cut into supremes can be blended in or folded into the final aioli. (Spread on our Kobe Beef Burgers with Carrot Fennel Slaw). This recipe can be easily adapted to use any of our dried peppers (although you may want to vary the amounts based on the heat of the chilies). Replace the vinegar in step 1 with the same amount of lemon juice and add reconstituted dried chilies (we recommend ½ a dried Chipotle pepper and 1 dried Aji Panca pepper) with their stems & seeds removed. Blend slightly longer in step 2 to make sure the chilies are chopped.